Sorry I have not been updating, but I am working on some things around here that I cannot wait to share soon. My posts may be a little sparse in the coming weeks, but I promise to share what I am working on and try to keep up as much as I can. One project that had my attention the last month is a bridal shower I threw for my future sister-in-law. I adore her and it was so fun planning this fun day with my mom. These were custom printed from Envy Marketing, which I found on Etsy. The venue is one of my favorite Italian spots in Chicago, Quartino. It's rustic charm, delicious food and impeccable service was the perfect place. Her favorite flowers are peonies, which were incorporated into the arrangements along with beautiful romantic bouquets. 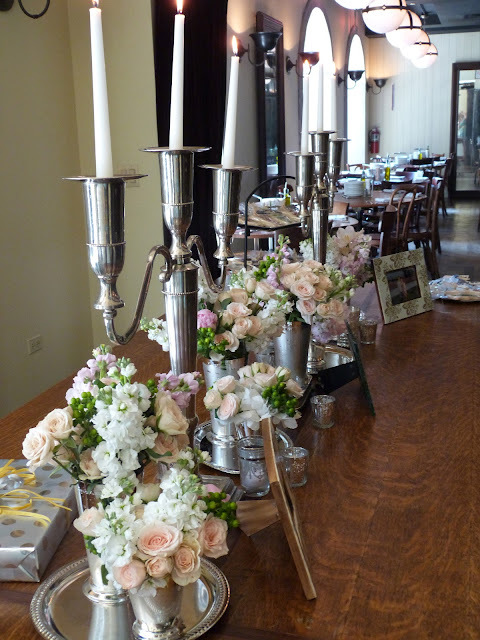 We worked with Debi Lilly, from A Perfect Event, for all of the floral. And once again (she was my wedding planner) she and her team put together the most gorgeous flowers. She also used silver trays, julep cups, and mercury glass votives, which the perfect combination with the rustic wooden tables and candelabras. For the favors, we ordered these custom cookies to match the invitation shape. Their monogram was scrolled on them and they were tied with dried lavender. Everyone seemed to enjoy themselves and the afternoon was filled with prosecco, pasta and laughter. The perfect combination.